We’d love your help. 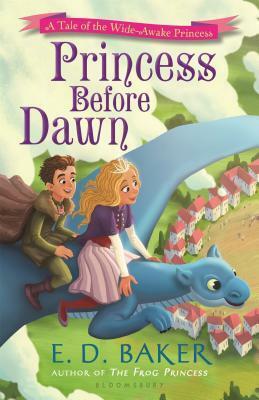 Let us know what’s wrong with this preview of Princess Before Dawn by E.D. Baker. In the seventh tale of the Wide-Awake Princess series, Princess Annie's beloved home Treecrest has become a favorite destination for all sorts of magical beings. One new set of guests are particularly strange, and they are ready to take over a new hunting ground. Annie and Liam turn to their only friends who can help, Francis and Zoe. But when Francis and Zoe arrive in Tre In the seventh tale of the Wide-Awake Princess series, Princess Annie's beloved home Treecrest has become a favorite destination for all sorts of magical beings. One new set of guests are particularly strange, and they are ready to take over a new hunting ground. Annie and Liam turn to their only friends who can help, Francis and Zoe. But when Francis and Zoe arrive in Treecrest, the new hunting group is having too much fun to pack up and go home and nothing Francis or Zoe say seems to help. To ask other readers questions about Princess Before Dawn, please sign up. Is this the last one in the Wide-Awake Princess series? It's a pretty calm read. This one was really good. I liked that Baker included Zoe and Francis. Audun was also in it a ton, which I really liked, since I love dragons, and this one of Baker’s series didn’t have a whole ton of dragons in it. I read her frog princess series, and when she intertwined them, I realized just how much more magic was in it than this series. In the frog princess, they use magic for so much more than enhancing looks! My favorite thing was that dragon magic could touch Annie. When, if you think ab This one was really good. I liked that Baker included Zoe and Francis. Audun was also in it a ton, which I really liked, since I love dragons, and this one of Baker’s series didn’t have a whole ton of dragons in it. I read her frog princess series, and when she intertwined them, I realized just how much more magic was in it than this series. In the frog princess, they use magic for so much more than enhancing looks! My favorite thing was that dragon magic could touch Annie. When, if you think about it, opens a lot of possibilities (better make sure witches aren’t using a dragon scale or something when casting their spells now!). I really like these series, but Baker’s got her Fairy Wings series she still hasn’t finished! I've read a lot by E.D. Baker and enjoyed quite a bit of it. For some reason, this particular series took a real nosedive for me. She's one of my "fun" reads and I almost had to force myself to finish this one. Wow, what an awesome end to a lovely series! Oh and I loved the humor around Squidge, he is so funny! It's nice that Annie and Liam have so many friends too. Very beautiful story. Loved the ending. E. D. Baker was born in Buffalo, New York and spent most of the next eighteen years in the Town of T E.D. Baker made her international debut in 2002 with The Frog Princess, which was a Texas Lone Star Reading List Book, A Book Sense Children's Pick, a Florida's Sunshine State Readers List pick & a 2006 Sasquatch Book Award nominee. The Frog Princess inspired the Disney's Princess and the Frog!